$4,800.00 Imperial Russian 1913 Pattern Officer's Saber. High quality Russian-made sword in nickel plated steel scabbard with imported Solingen blade. 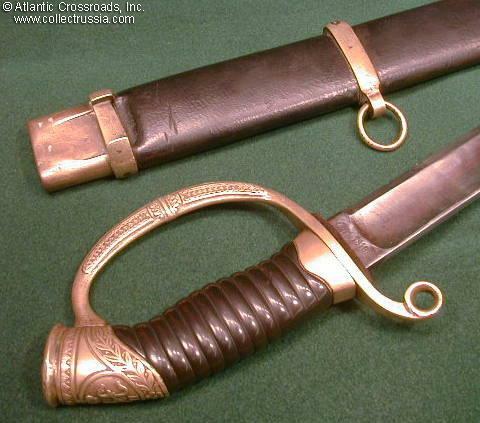 Last infantry sword pattern introduced before the Revolution, this Model 1913 saber was issued following the fall of the Russian Monarchy in February 1917 but prior to the Bolshevik revolution in October of that year. An amazingly well-preserved piece: condition-wise, this is one of the best of any Russian edged weapons of the Imperial era we have handled. $3,450.00 M 1834 Cavalry Enlisted Man's Shashka of the Asian Type (so- called Nizhegorodka), dated 1916, a truly remarkable example with a 34" blade.